Photograph showing members of the Miller family in front of their residence on the corner of Spring and Muhlenberg Streets in Woodstock Virginia. Identified from left to right are: J.R. Miller, baby Josephine Miller (Lynn), unidentified, Mary Miller. 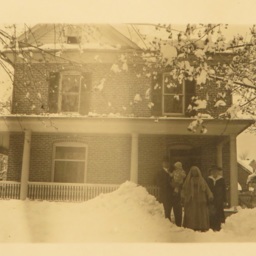 Unknown, “Miller Family,” Shenandoah County Library Archives, accessed April 24, 2019, http://archives.countylib.org/items/show/11407.